Community members stand at the intersection for hours at a time urging drivers to slow down and be safe. Photo by Sophie Bolich. 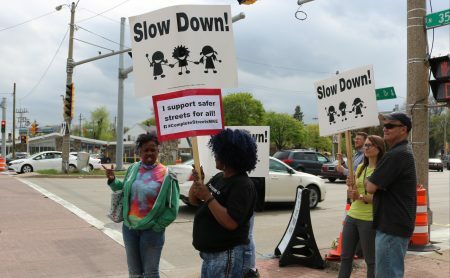 The Northwest Side Community Development Corp. held a Rally for Safe Streets Monday, the latest in an effort to control traffic accidents on the infamous stretch of Capitol Drive between 30th Street and Fond du Lac Avenue. For the one-hour duration of the rally, the usual blaring car horns and screeching tires at 35th and Capitol turned to friendly beeps and waves in support of the cause. Alderman Khalif Rainey has called attention to the problem of reckless driving in the area, reporting in a news release that the Wisconsin Department of Transportation ranked 35th and Capitol the most dangerous intersection in the state. There are several schools located near 35th and Capitol, endangering children who have to walk and ride buses on the dangerous road. Photo by Sophie Bolich. “We need all drivers to recognize the responsibility for safety when they get in the car. We also want to look into engineering solutions that could calm traffic and improve pedestrian crossings,” said Rainey in a news release. 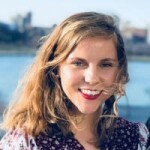 Sarah Bregant, community development specialist at the Northwest Side CDC, said the group began organizing rallies in response to traffic deaths in 2017, but is not satisfied with the results. Bregant said the CDC wants to target reckless drivers. A key strategy for changing people’s driving behaviors is to enforce consequences, which O’Connell said has been more effective since community members drew attention to the problem. According to Milwaukee Municipal Court records, there was a 30 percent increase in traffic tickets citywide from 2016 to 2017. Sgt. Sheronda Grant, a spokesman for the Milwaukee Police Department, said that officers are working on controlling road sfety in the city as a whole. “It’s definitely on our radar, the issue of reckless driving,” she said. In 2017 the Northwest Side CDC organized a community bike ride and picketing to raise awareness. 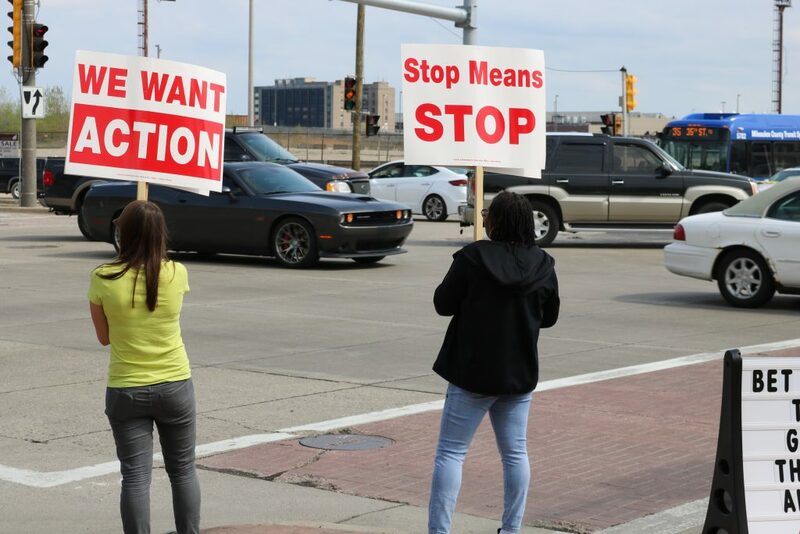 The group is also a member of the Complete Streets Milwaukee Coalition, and is currently circulating a petition asking the city for a new street design on 35th and Capitol as well as other intersections throughout the city. The design would include crosswalks and defined bike lanes (such as those on Humboldt Avenue at Locust Street and Center Street) to improve safety and convenience for motorists, as well as bikers and pedestrians. The petition has 186 signatures so far. Bregant said the road safety problem seems to be on the radar of almost every alderman in the city. However, infrastructure changes are a slow process, so working to encourage safe driving and seat belt use is a quick solution for the moment. Traffic crashes killed 64 people in Milwaukee in 2017; 57 people were killed in 2016, Milwaukee Neighborhood News Service reported, based on Milwaukee Police Department data. The city’s traffic study process is thoroughly broken. Having watched several of these, the city’s most deadly/problematic streets have all been studied incessantly, but since they were labeled “arterials” decades ago, it seems to preclude any commonsense traffic calming actions. The DPW’s methodolgy cares more about traffic flow than human life and neighborhood vitality.